CardBoard has never looked better. Carbon Fiber. Aluminum. Steel. Bamboo...and now CardBoard. This has replaced bamboo bikes as my favorite material used for bicycle production. Bamboo is amazing - can be grown to the shapes and contours of a bike frame & molded in so many ways - but the CardBoard Bike has unlimited possibilities - think of all the shapes, sizes, built-in-addons - and it is all made with the same cheap material - all the way down to the wheels & seat. In the Spring of 2012, Michigan Ave. was sported a Gulliver-sized Marilyn Monroe statue in her iconic upwind pose. Other than the "new perspective" tourists had on the blonde beauty, the statue exploded on Social Media. Instagram photos could be found across the web and the statue truly brought out the "paparazzi" in everyone who came to see Marilyn in all her glory. I had been wanting to photograph the iconic statue for quite some time, but had not been able to find a day that rainy spring where the lighting and timing lined up. Thankfully, one night while walking home from a late night at work, I came across a unique view of the statue. It was in the midst of deconstruction, half-strapped down to a truck, ready to move on from Chicago. Armed only with my iPhone, I had to jump on this last-chance to snap a shot and capture a limited-time shot of the statue before it disappeared forever. Marilyn was anything if not a chaser of dreams, and the massive statue was a tribute to the enormity of her stature. But what if you clashed the icon of what she represents with the strapped-nature of the statue being torn down. With this in mind, and utilizing the same Instagram programs of the tourists before me, and adding text via Illustrator, I created the following poster - the antithesis of two words - the outer Marilyn & the inner turmoil of the artist. While exploring this artistic rendition of the Marilyn statue, I was listening to Death Cab for Cutie and a song really stood out in my mind that seemed to call out to the above. 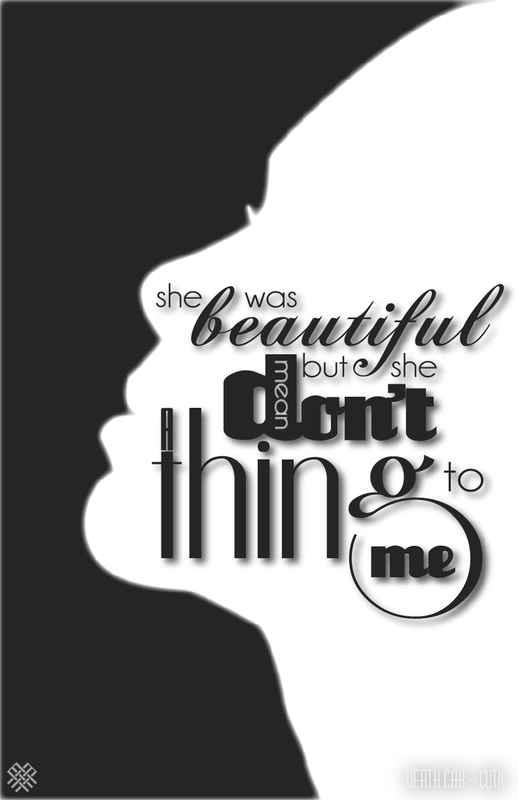 The song is "Tiny Vessels" and along with the Marilyn project, it inspired me to create the following typographical exploration. Helvetica: The aim of the new design was to create a neutral typeface that had great clarity, had no intrinsic meaning in its form, and could be used on a wide variety of signage. And between the truths, the lies, and the pages, on which I have been transcribed, lies a me that you may never see. A font. A Typeface. With real emotions, expressions, and spaces of my own. I recall the old days, written by hand. There was so much that went into each letter, each phrase, each dotted i and crossed t. A uniqueness and confidence that brought me to the forefront of the design world. But with the advent of the computer, I fear that I will become lost, alphabetized, numerically ordered, or preset. My legs, my arms, my i’s, all pre-designed and carefully placed on a shelf to be used by the highest bidder, over and over again, until my face is lost among the generic background of a city, black and white and indiscernible. As I am shuffled through the crowds, it’s my premier. The make or break. From here I find my future, good or bad, here it comes. I receive my firs signage, an advertisement for toothpaste. I don’t stand out, and for that I make a scene. I am perfectly unnoticed and become the hottest font to hit the shelves. Call me vain, call me self-righteous, but you can’t compete with what I got. Like they say, “when you got it – flaunt it”, and I have it in spades. More anything? More Everything! I fly off the racks and into the logos of major corporations (AT&T, BMW, Jeep). I concurred cross-country travel via the train systems, infiltrated government documents, and have even been in outer space. Call me proud, call me a fad, but I will be here for awhile, so get used to it. Needless to say, the world was my canvas, and one night, in the back of CLUB NEGATIVE SPACE, I saw her. Ms. Yummy Apology, Curves so fluid, and i’s so curled that my decenders ascended. I crossed the bar and we found each other, eurostyle in the alley. What does Times have that I don’t?!? He is just a guide, I’m a name brand. I could end him, he would never see the light of page again. I hate Times, the Roman piece of sh*t. I could have his entire family killed, his bolds and italics erased from the page. I will make it my mission to ensure that he is destroyed, his name will be removed form the font-libraries, and he will be nothing but a sad memory in antique books, rotting on shelves in musky old libraries. It makes me think, was it me? Why was I not good enough? I will never love again, I will never trust again. The future is bleak, worthless, what is the point? My only purpose is vengeance; my only reason now is revenge. I will have my revenge on Times, I will make him pay. Cutting a deal with some old friends who owed me a favor, I replaced him as the default type in MS word. I was in control, I was the best, I was everywhere. “The big shot – to big for his own good.” I had become too greedy, too proud. I made enemies of friends and alienated myself from the text community. Betraying one of our own, I grew to big. There was not enough room for me as both header and filler. I couldn’t hold it together. I fell apart, lost discernability, I became generic. Copy-cats of all sorts came out of the woodwork and my appeal slowly fell. At my lowest, I was being used as the basis for an armature design student’s art project. I felt so humiliated. I had sold-out, I was a default, I was everywhere and I was free. No longer the prominent logo I used to be, I had hit my cap height at an early age and it was all-downhill from here. I was washed out and had come to the end of my rope. I learned the hard way that I needed to make peace, needed to find my place, needed to rebound. Thankfully, there were those who took pity on me. Those who sympathized with my situation. They had been there, they had seen it, and they gave me refuge. I was taken in by Comic Sans, a good friend from the old days. He too knew what it was like to hit your height and fall. He was almost universally loathed for nothing more than being himself. Comic understood what I was going through and gave me a place to stay and recoup. One night, while Comic was off doing Stand-up at the local laugh-house, I decided to go for a walk. It was dark and there was a heavy fog in the air. I became lost and found myself outside of an old, broken down, shanty of a home with a sign that read “Futura – Foreseer of Time and Knowledge” I was inexplicably drawn to this place and before I knew it was staring into a glass ball, with Futura telling me of my past, present, and future. I left with the knowledge that things would be better. The future was not as bright as it once had been but it was brightest flicker I had seen yet. I changed that day; I became a more attentive student of typography. Looked for new ways to reinvent myself and highlight my hidden characters. I became a better font, and a better friend. I reached out to Comic whenever I could, trying to get him gigs along with me, looking for way for us to collaborate. I became loyal to my friends, and civil to my enemies. After awhile, things began to pick up. I was chosen for the new signage for Chicago’s Elevated Train System, a big break, one I was not going to screw up. Every day, I brought people to the places they needed to be, sometimes I was stolen and hung as art in college student’s dorm rooms, and then one day, I saw her. Passing the Chicago Stop at a cool 25 miles per hour, there she was, Luci Da. The most beautiful type I have ever laid my i’s on. As I courted her, we walked the length of the lake letting our letters flitter away in the breeze as we spoke. We read each other’s lips and consummated our feelings for one another under the docks. Our relationship grew to love and I knew that we would be forever. Life had hit a stride, I had a regular job, I was with Luci, it all seemed to be going right. What more could I ask for. I was in love, things were well. I could die right now and be happy. That is to say, until Luci came down, with her mean line brimming. I had noticed her lowercases had grown a bit, but it was not until now that I knew why. “We are going to have a little Luci-Helvetica!” she screamed! I was speechless. For the first time not a single letter left my mouth, until I could finally compose myself enough to smile, wipe a tear from my eye, and hug my beautiful wife. As happy as I was, I could not deny that this changed things. My salary hardly covered our own expenses, let alone being able to start a college fund. The future is once again looking scary, but I am filled with hope.